« What’s the Breaking Point for Oil Prices in Northern NE? Two charts may tell an important story about New Hampshire’s labor market and perhaps trends in the economy. 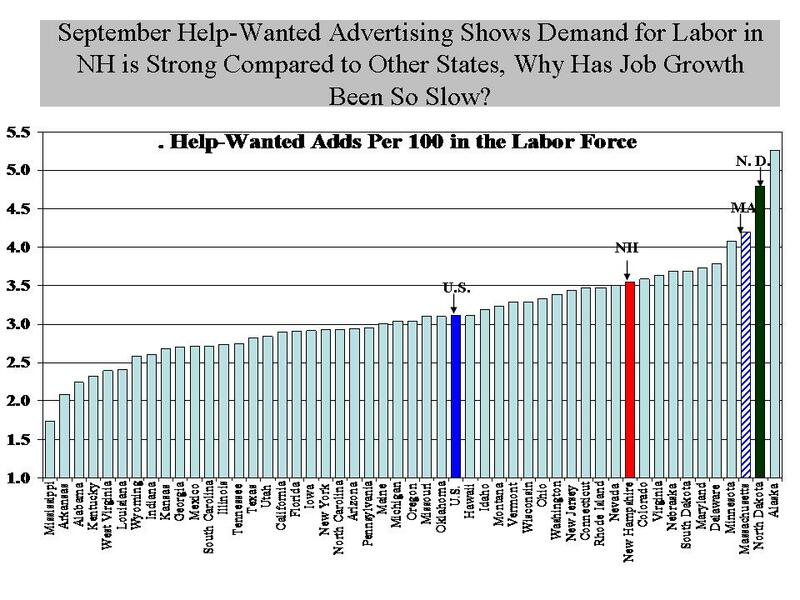 Help-wanted advertising has been rising in NH and as I’ve written before, it suggests job growth should be higher in NH based on the long-term relationship between help-wanted ads and employment growth in the state. A “skills gap” is one explanation for the divergence between help-wanted and job growth in NH, but I also offered that the divergence, along with trends in aggregate wage growth in NH may mean employment numbers will be revised upward. My money is still on an upward revision of job growth, with the skills gap playing an important role for some industries and occupations, because NH has more help-wanted ads per 100 individuals in the labor force than all but 10 states – job growth should be higher (chart below). 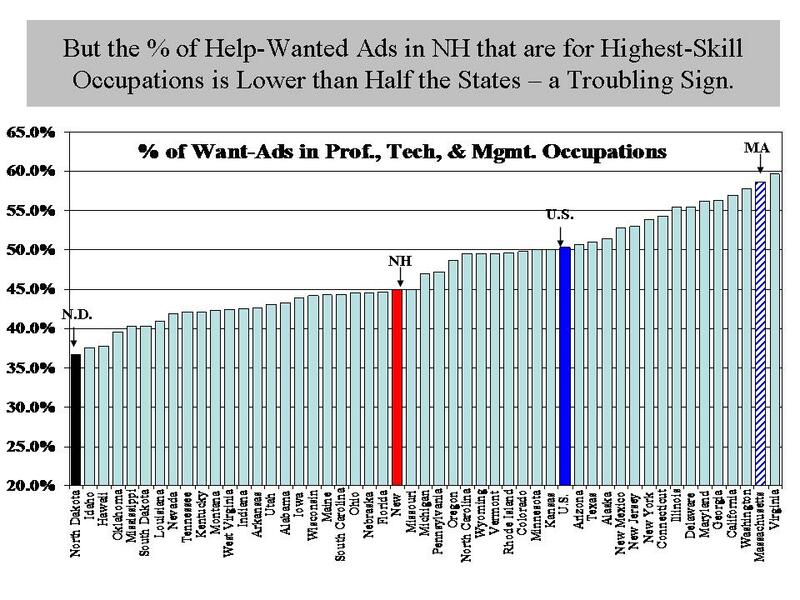 I would be more convinced of the skills gap being broadly responsible for slow growth in the state if a high percentage of help-wanted ads in New Hampshire were for the highest skill occupations (professional, technical, scientific and management), but as the chart below shows, NH ranks well down the list of states on the percentage of help-wanted advertising that is for the highest skill occupations. A skills gap could still exist between available jobs and available labor for occupations requiring specialized skills and training, even if they are not in professional, technical , or managerial occupations. Anecdotal evidence suggest many employers are having difficulty finding workers with the right skills. The skills gap demands further investigation, right now I am more concerned about what the relatively lower demand in NH for the highest skill occupations implies about our state’s economy. This entry was posted on October 18, 2012 at 2:47 pm and is filed under employment, Help Wanted, job growth, Labor, NH Economy, Skills Gap. You can subscribe via RSS 2.0 feed to this post's comments.